Trains and Intercity Transit in South Korea, Part 2 | S.K. in S.K. 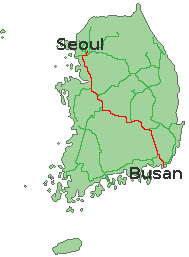 The one heavily used interregional passenger rail line in South Korea is the line running from Seoul to Busan. Not only does it go from Seoul/Incheon to Busan, it also stops in Daejeon and Daegu, which means a single train line serves all of the five most populated cities in South Korea. As it so happens, when I left Busan for the last time, I was heading towards Chungcheongnam Province, which meant I could take a train from Busan to Daejeon along this train line. I originally thought I had lots of time, and that I could take one of the slower trains. However, because I thought I had so much time, I decided to enjoy a slow, delicious lunch in Busan, and the slow trains are so infrequent that I easily missed them (they might have been sold out anyway since they are cheap and popular). That left the Korea Train Expresss (KTX), which is the fastest train in South Korea. It’s not as fast as Japan’s famous shinkansen, but it does go at 305 km/h (190 miles per hour). It’s much more expensive than the mugunghwa-ho trains, but that meant that lingering in Busan had not been a problem for me. As it so happened, the next KTX train, bound for Seoul, was sold out, but they found space for me on the next Incheon Airport bound train, which also stops in Daejeon. My ‘ticket’ was merely a receipt, and nobody – human or machine – ever checked it. I went straight to the platform and just boarded, and as far as I could tell, it would have been possible to do so without any ticket whatsoever. I later found out why they don’t need to check tickets. I remember, when I first boarded the train (it was about twenty minutes before departure) there were plenty of empty seats, and I naively thought maybe there would be lots of space. Ha ha ha ha. By the time the train departed every single seat was filled. And if someone tried to sneak aboard without an assigned seat … well, every seat was claimed by someone with a valid ticket/receipt, and standing is not permitted on the train. I ended up sitting next to a South Korean soldier who is posted on Ulleungdo. He had taken a ferry to Pohang, and from Pohang got to a KTX station. He was on leave, and was going back to visit his family in Seoul. Ulleungdo is a place I strongly considered visiting, but I ultimately decided against it because a) the ferry tickets are expensive b) it takes a few hours each way c) there’s practically only one ferry per day to/from Gangneung, Donghae, and Pohang, and the ferries are not always conveniently timed. So in addition to buying expensive ferry tickets, I would have had to sacrifice at least a few days which I could otherwise spend seeing a lot more places on mainland South Korea. If you want to know what I missed, this blog and this blog and this blog describe journeys to Ulleungdo. The train went from Busan to Daejeon in less than 90 minutes. Nice. What was not nice was that I had to spend more than 90 minutes in Daejeon – in the rain – because people gave me incorrect directions for reaching the bus terminal which has buses to Buyeo. As it so happens, the soldier who was sitting with me had to change seats because, when he bought his ticket, there were no through-seats to Seoul available, but there was one seat which was available until Daejeon, and a second seat which opened up at Daejeon. What can I say? The train system is South Korea in a nutshell. Either there are few people and service is sparse and slow, or there are tons of people vying for a seat, and it’s fast and frequent and efficient. This entry was posted in Chungcheongnam, City, Gyeongsangnam, Overview, Sea and tagged Busan, Daejeon, high-speed rail, Korail, Korea train, KTX, trains. Bookmark the permalink.